It took us 8 and half hour to reach Kuala Lumpur. The previous time to Art of Speed, I took 5 hours. Of course, that was without all the makan breaks and I was travelling at 90-100km/h. I know, I know. Friends who ride big bike, you may go ‘WTF! I only take 3 hours to get there’. There was some problem with my gear shifting. I could not shift from gear 4 to 3. After some lubricating with gear oil on the gear selector, it was working fine. Ah Weng’s cheap $20 Vee Rubber tyre cracked so we had to use the spare already. Wei Jie was supposed to join us the next day so we asked him to bring us some parts – gear selector and 8 inch tyre for Ah Weng. Machiam support vehicle. I do not recall we have a "Honk if You Like Vespa" sign on us, but we got quite a number of honks and thumbs up from other road users. At one of the petrol station, a Malaysian motorcyclist on his Bellini requested to take a photo with us. We arrived in Ipoh at 7.30pm before total darkness engulfed the road. Checked in at nearest hotel to the highway MH Hotel for RM248 a night. It was a bit over my budget as it is high peak season. Everybody is going home for Raya. We parked in front of the lobby and there is a security guard there. My gear was working fine again. Anyway, we were to meet up with our “support vehicle”, the KTM 690 Enduro. We took our own sweet time to leave Ipoh while Wei Jie tried to catch up. Little did I know Ipoh is quite a charm herself. There were many limestones mountains and the scenery was great. At the RnR, we met Wei Jie and he took a rest first. Since Wei Jie was on a much faster bike, he will overtake us and wait at the next parking stop or RnR. When he spot us again, he will ride and overtake us again. We were maintaining this until he did not spot us for a long long time. I was leading the way, keeping left to the road shoulder as usual and I miss the exit sign that states “Georgetown”. By the time I realised I am exiting the highway, it was too late to turn back. No choice, we paid the toll and tried looking for a U-turn. No U-turn in sight. We had no GPS, just relied on maps and road signs to get our way round. Yesterday we also exited the highway early into Nilai. This time, we were kind of glad we took the wrong road because we saw this. On the Penang Bridge, I marvelled the grandeur of human architecture and at the same time, revelled in the sea breeze’s caress. We kind of arrived 3 weeks early for the 3 Nation Charity Ride. Since we are already at the Penang Bridge, might as well do some phototaking. We only managed to find a U-turn very far into the island. I guess Wei Jie who was up ahead was worried why we were taking eons to catch up. So I just dropped him a message asking him to take a nap. It was our first time crossing Thai border with our vehicles for Sharon and I. Ah Weng rode to Phuket last year but was not involved in dealing with the bureacracy of border crossing. Wei Jie was there to guide us. The vehicle insurances that we purchase in Singapore do not cover Thailand. Just around 30km before the border, we purchased vehicle insurance (RM40 for 1 month) at Changlun Tours. Where we bought our vehicle insurance. At the custom, beside getting our visas stamped, we also need to get a temporary vehicle import permit. 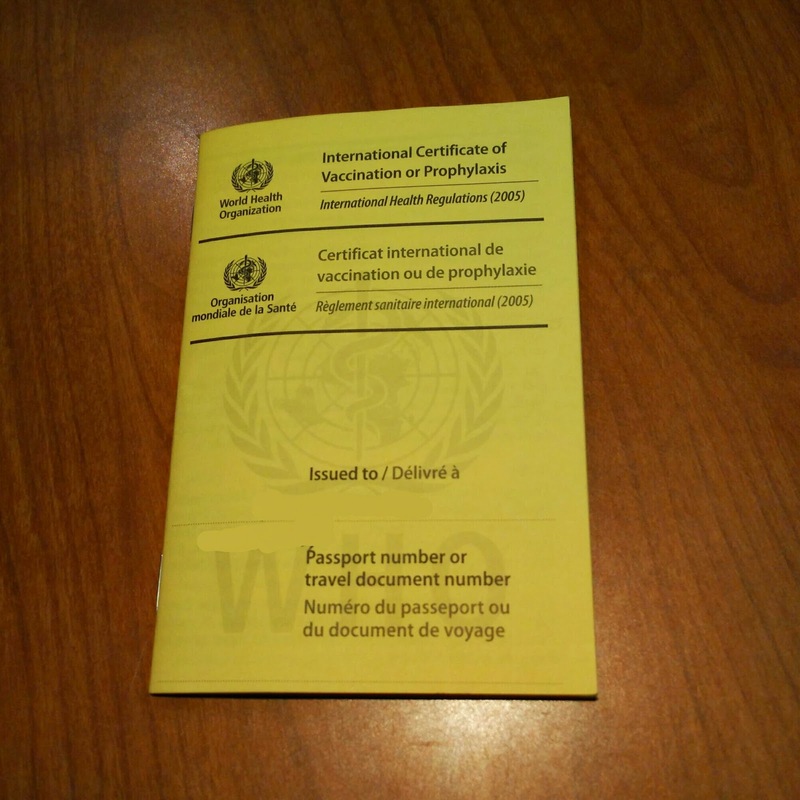 This requires the vehicle logcard because they need the vehicle model for the permit. This permit is always done by the same lady. Cherie calls her the menopausal lady. Vehicles models that had enter Thailand border before will have a record in their database. 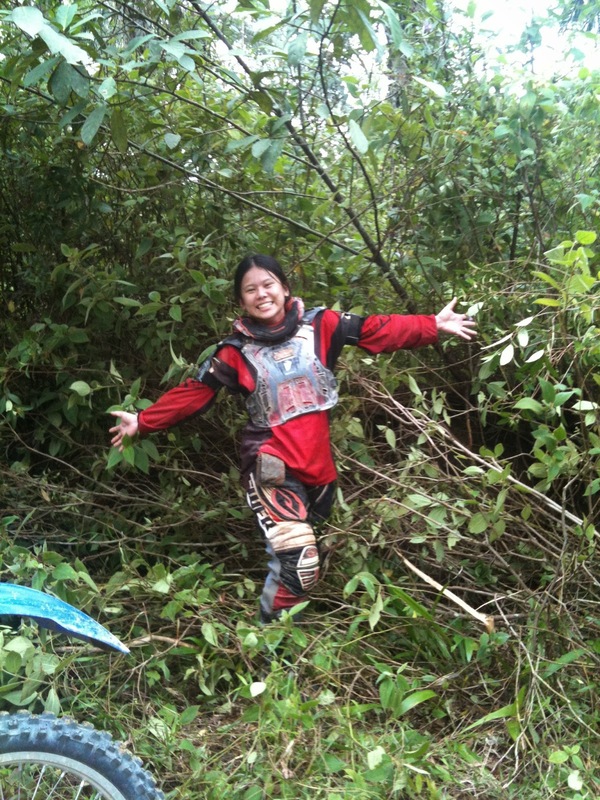 Wei Jie’s KTM 690 Enduro is the first and so are our Vespas. So she had to create new record for all four vehicle models. I could see her face was on the verge of menopausal fits because those were extra work for her. She scolded Ah Weng because his logcard prints was too small. So if you are entering Thailand with own vehicle, welcome to Land of a Thousand Smiles plus one Grumpy Custom Officer. Riding in Thailand was a new culture for me. First it is common to ride without helmets. Second, many motorcycles ride in the opposite direction in the motorcycle lane. Third, drivers hardly signals or do so at the very last minute. However, it is difficult to drive fast in the town so there is enough reaction time to anticipate the driver’s move. We stayed at Winstar Hotel, 1090 baht for a triplet room but it is spacious enough to have another person sleeping on the floor. Parking is located inside the building with a guard as well. We had a hearty breakfast buffet at Lee Gardens for only 150Baht (S$6.20). I was getting the hang of riding in Thailand. When in Thailand, ride like a Thai. Just have to be more daring when making turns but not to the point of recklessness. Wei Jie brought us to the Hatyai Municipal Park where there is a temple on top of a hill overlooking Hatyai. There is a big Buddha statue where many bikers like to pose with their bike for photos. The security guard did not allow us to ride further up to the temple so we had to walk up. Whatever you do, do it with your heart and soul. Wei Jie suggested that I, being a lady, use my charm to persuade the guard in allowing us to ride up. I learnt some Thai from my cousin's wife. I only know how to say 'motorcycle' and 'please' in Thai, the rest was expressed in hand language. So I rode up and got Wei Jie to take this photo. Ah Weng and Sharon later took their turn. We left Hatyai only at 12 nn. My turn to lead the way again after exiting Hatyai. We would be taking the coastal road to Don Sak where we would be taking the ferry to Koh Phangan. No GPS to lead us, just old school paper map and a pair of observant eyes to look out for road signs. It is actually pretty easy to navigate around the main highways in Thailand because they are all labeled with a number. Amazon Cafe at almost all PTT petrol station. Lovely place to wind down before riding again. Numbers with few digits are major highway that leads to major cities. The more digits it has, the more minor the highway which leads to small towns. So I had to memorise the numbers and just have to keep a lookout for the exit to the subsequent number. We were caught in a jam at Nakhon Si Thammarat, school children are finishing school and parents are picking them up. A local told us that we could have taken a less busy road parallel to this one. The sky began to loom with dark clouds. While we were refueling at a petrol station, the sky poured. We observed a canine couple making love in the rain for a good 10minutes. It seemed like the rain was not going to stop so we decided to ride slowly in the rain. Once at Don Sak District, the sun was beginning to set. Our riding speed was further slowed down by the darkness. The 2 for $10 headlight was put to the test. It was very bright but draining my battery in 20 minutes. We did not have lunch. Once we arrived at Raja Ferry Port (around 8pm), there were no more ferries. We were all cold, wet, hungry and tired. Not far away was a sign with the word Pha Pha Resort so we took that road. The entrance to the resort reception was laden with gravel and upslope which didn't help with our weariness. Wet, cold and hungry while waiting for our dinner. We were quoted 600 baht a room which accommodates two each. Andy and Sim Eng (they travelled around Thailand and Laos for two and half months) shared with me that we can bargain, particularly during low season. Plus in Thailand, we can view the rooms before committing. The rooms were pretty decent. We managed to bargain to 500baht (S$20) for each room. Juvena.. Love your post! Reading your post makes me feel like planning for a road trip! Awesome and informative blog! Good to know that small cc bikes can go the distance!! Thank you for the comment. I am glad to share these information to prospective travellers. My notion - It's the rider, not the bike. I just briefly read your blog. Keep up with the wanderlust and continue your work. Hi Great Post!! Admire you gals riding all the way to Thai !! First and foremost, Scooterpartsco.com is run by enthusiasts. We are active Scooterists who ride almost every day. Scooterpartsco.com started over a Vespa Starter Motor. We run a very busy scooter repair shop and when the local Vespa dealer packed it in, we started getting most of the Vespa service. The first time we priced out a starter for an ET4, and then realized it is the same part that was used on a lot of Japanese bikes and is about half the price from them, we decided to figure out why Vespa parts are so expensive in the US. We give options in vespa parts, malossi parts, malossi vespa parts, honda forza, honda pcx, yamaha smax, yamaha majesty, suzuki burgman and performance scooter parts. Great Article. Thanks for the sharing, I also found a useful service for forms filling. By the way, if anyone is facing a problem of filling USCIS I-485, I've found a template here http://pdf.ac/3CBk8b. You also can esign the form and fax it. wow. 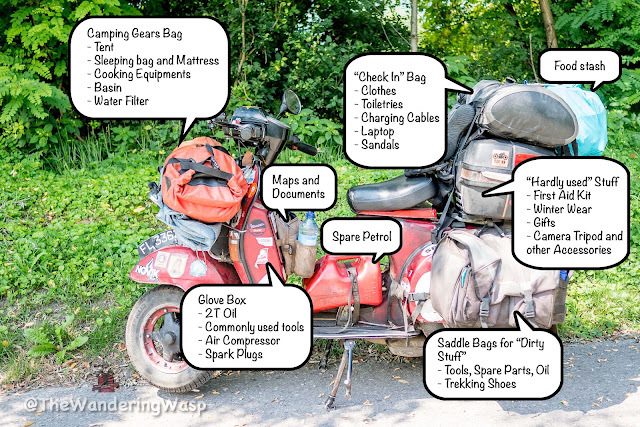 vespa all the way to to Thailand? It would be the best adventure ever to travel from Singapore to Thailand on bikes. Thailand's jungles and waterfalls are just adorable. Scanning for vespa parts, we give the first and guaranteed material about parts related vespa. Here are open all choices related to malossi parts and Honda forza or yamahasmax. In love with those road travel trips. Both of the places are recommended to travelling. We can view the rooms before committing. Hi! I'm Thien Nguyen from Vietnam. Thanks so much for your sharing and those nice pics. It's so useful and detailed. If you wish to have some local friends who can help you during your trip in Vietnam, you can book a Vietnam Free Tour from GoAsiaDayTrip. This is totally a free-of-charge program so you don't need to pay for that. Hope that you can come and explore our beautiful country.